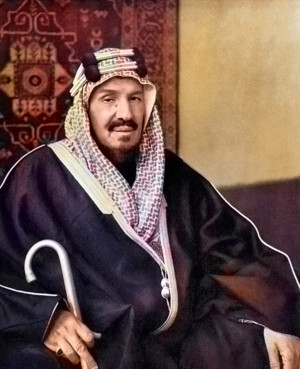 Abd al-Aziz Ibn Saud ruled Saudi Arabia from 1925 to 1953. He unified various tribes from the Red Sea to the Persian Gulf beginning in 1902 and named a new country after himself in 1925. He was the first Monarch of Saudi Arabia and was also known as Ibn Sa'ud. Abd al-Aziz Ibn Saud was born in Rijadh into the House of Saud, which had historically maintained dominion over interior highlands of Arabia known as Najd. Saud followed his family in exile in Kuwait following the conquest of the family's lands by the Rashidi. The Rashidi were a historic house of the Arabian Peninsula, the most formidable enemies of the House of Saud at the time. Ibn Saud spent the remainder of his childhood in Kuwait. Abd al-Rahman had a stipend from the Turkish government of 60 Turkish pounds a month and Ibn Saud went on several profitable raids in Najd as he grew into adulthood. He attended the daily Majlis of the Emir of Kuwait, Mubarak al Sabah, from who he learned much about the world. His family supported the Wahhabi movement. It is an Islamic movement named after Muhammad ibn Abdul Wahhab. In 1924 the ibn Saud of Saudi Arabia who was influenced by the teachings of abdul Wahhab conquered Mecca and Medina, the Muslim holy cities. ↑ New York Times, October 19, 1945. This page was last modified on 2 December 2018, at 00:29.